Work to replace the Greater Nanaimo Pollution Control Centre (GNPCC) outfall has been ongoing since 2014. We thank you for your patience and understanding throughout the replacement process. The Regional District of Nanaimo is happy to announce that the GNPCC Outfall Replacement Project is now complete! The new outfall is expected to be in service for 70 years or more. Remediation of Morningside Park will follow in the coming months. 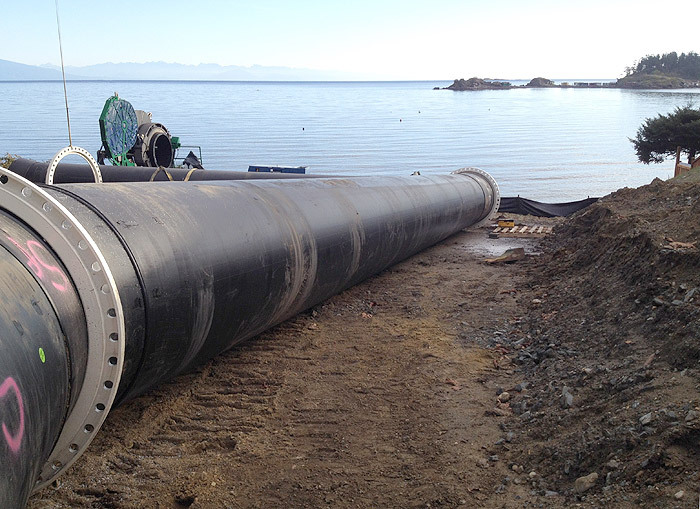 April to September 2016: The 54" diameter HDPE (high density polyethylene) pipe is being assembled in Nanoose Bay with the cooperation of the Nanoose First Nations. Two sections of pipe will be assembled from land at the Nanoose Reserve, eased into the bay, and floated on the water surface in a westerly direction from the assembly area. Once the pipe is assembled in Nanoose, the sections will be joined together and towed to Morningside Park for installation during the June to September 2016 fisheries window. December 2015-February 2016 (complete): The RDN completed an eelgrass salvage and performed dredging, blasting, and drilling in the outfall right-of-way to prepare for the marine outfall installation. The timing of these works takes advantage of the winter fisheries window. Photo: Dredging the outfall right-of-way during the winter fisheries window, January, 2016. October to December 2015 (complete): The RDN is constructing a section of the outfall from Morningside Drive to the intertidal area. Photo: Construction of the outfall through Morningside Park, January 2016. December 2014 and July 2015 (complete): Emergency repairs were performed on a section of the outfall still needing replacement. 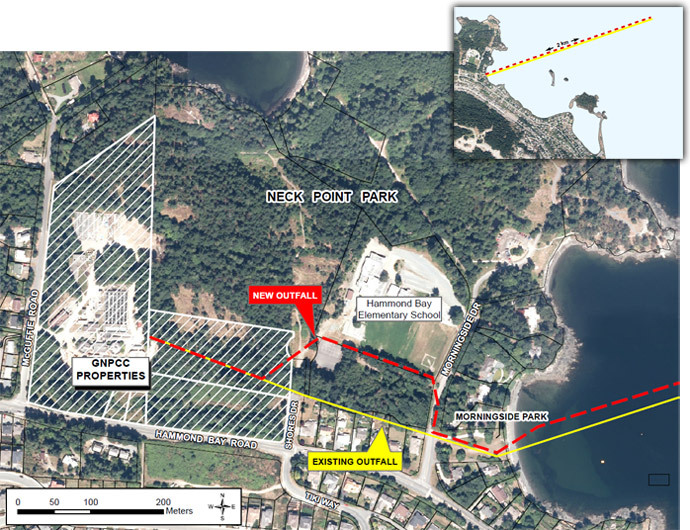 Summer 2014 (complete): The land section of the outfall from Greater Nanaimo Pollution Control Centre to Morningside Drive was replaced at a cost of $3.5 million, with the help of a $2 million contribution from the federal Gas Tax Fund. If you have any questions about the outfall replacement project, please contact Sean De Pol at 250-390-6560.